This Carnival, however, would be unrecognizable to the originators as it is akin to Trinidad's annual pre-Ash Wednesday celebration. Costumes, mas bands, music, and festivities are elements that were brought over by Trinidad's top promoters (I see you Caesar's Army) and designers. Although the elements may be Trini-influenced, the vibes were distinctly Guyanese. In an informal discussion with some locals, I asked how I should dress for one of the parties. "How you should dress? It's a soca party. You dress like it’s a soca party." They meant that I should be as comfortable as possible as I would be wining whole night. Oh, Guyana. If only you knew how some people get dressed for soca parties in Trinidad.... but I digress. Partying for days is not new to Guyana. There is already a big celebration - replete with a Soca Monarch competition - called Mashramani. Mash is held on Republic Day, February 23rd, and competes with Trinidad’s more popular Carnival for tourism. There is also JamZone in August which will certainly test your party stamina and ability to endure extreme heat. The new Carnival, however, takes place around Independence Day, May 26th, which means visitors can use this to kick start their Summer. Note that this is also the rainy season in Guyana so be prepared to fete with umbrellas as the rain is heavy and can last throughout an event. I kicked off my Carnival celebration with Kes the Band's Tuesday on the Rocks concert at the Georgetown Marriott. What a welcome! The VIP section included complimentary food and El Dorado drinks to make sure you have a good time, which I did! Before the Trinidadian band of brothers took to the stage, Guyana’s own Jumo Primo warmed up the crowd. The former Byron Lee and the Dragonaires lead singer has become one of the premiere artistes in Guyana. This is partly due to his raspy singing voice, but mostly due to his "Rubber Waist." No, Ladies. He did not show off his wining skills at this particular event, but he doesn't have that moniker for nothing. Jumo was not the only Guyanese soca artiste to hit the stage that night. The artistes who are featured on the most popular riddim for the Carnival, the Bamboo Fiah Riddim, also graced the stage. Michelle King, known as Big Red, showcased her amazing voice when she sang the national anthem early in the night. However, when she reappeared on the stage, the crowd erupted. When she sang out "When the soca plaaaaaaaaaaaaaaay!” they responded “make yuh body talk to meh!" Lil Red, her son Jonathan King, also has a song on the riddim called “Cyah Dun.” Timeka Marshall, known for her collabos with Kes the Band, Marzville, and Busy Signal, also took to the stage to sing her hit “Purrfect.” Trevon Vibez whose song is the riddim’s namesake, "Bamboo Fiah," showed that his smooth voice is accompanied by a smooth GT waistline. 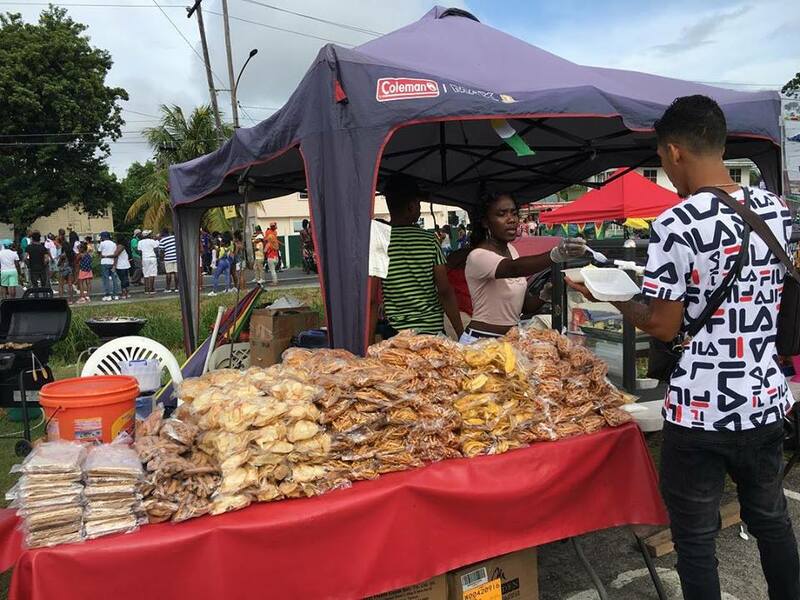 Each night offered activities from fetes, to beach limes, to both a moving j’ouvert and a stationary j’ouvert - because it’s Guyana and one j’ouvert just wouldn’t be enough. In between the parties, I found time to indulge in Guyanese food like cook up rice, fish cakes, pine tarts, and chicken foot with sour (always get the sour). I mean, I needed the fuel for the pump- get it? Never mind. The largest and most anticipated event was held on Friday night. RevelNation featured the biggest names in soca: Bunji Garlin, Fay-Ann Lyons, and Machel Montano. Once again the Guyanese artistes on the Bamboo Fiah performed and were able to share the stage with these soca heavyweights. Whew! People like peas! The National Stadium was full of people partying shoulder to shoulder. And my friends were right. Folks were dressed to get on: sneakers, incredibly short shorts, and tee shirts. Although the event was packed, there was NOT ONE incident the whole night. In fact, there were no major incidents for the entire week of partying. On Saturday all roads lead to... well, the road. The Parade of Bands may have had few mas bands, but it was a lively moving party with great deejays and live bands to keep up the vibes. The parade started at the Seawall by Carifesta Avenue and continued all the way down Vlissingen Road and back, ending at the National Park. All in all, this was not bad for the first Carnival. As with any new and foreign-influenced event, there are some who do not see a need for it. Mashramani is already a big celebration and they don’t see a need to incorporate Trinidad’s style or their promoters. However, many hope that this will allow visitors to experience Guyanese culture, food, and hospitality. “Next year is going to be bigger and better, because we're learning from this one," says Bobby Vieira, Chairman of Guyana Carnival. His final note to those who missed out, "Next year, just get here!" Jumo Primo says Guyana will become the party capital of the world!